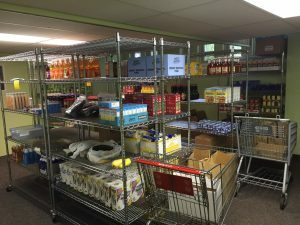 The Food Pantry is open Monday through Friday from 9:30 a.m. – 10:30 a.m.
Clients are able to use the food pantry up to 12 times per year (every 30 days) with their referral from North Kent Connect. The pantry is located in the lower level of the Cedar Springs United Methodist Church @ 140 South Main St., Cedar Springs, MI. Closings: The pantry is closed on all major observed holidays. 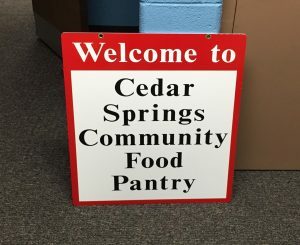 Weather closings for Cedar Springs school district will result in the food pantry being closed. Closing information is published on WOOD TV 8 and WZZM television stations. If you have questions regarding the pantry, you may contact the church office at (616)696-1140.